Yinka Shonibare, MBE, Addio del Passato, 2011, still from a color video, 16 minutes 52 seconds. 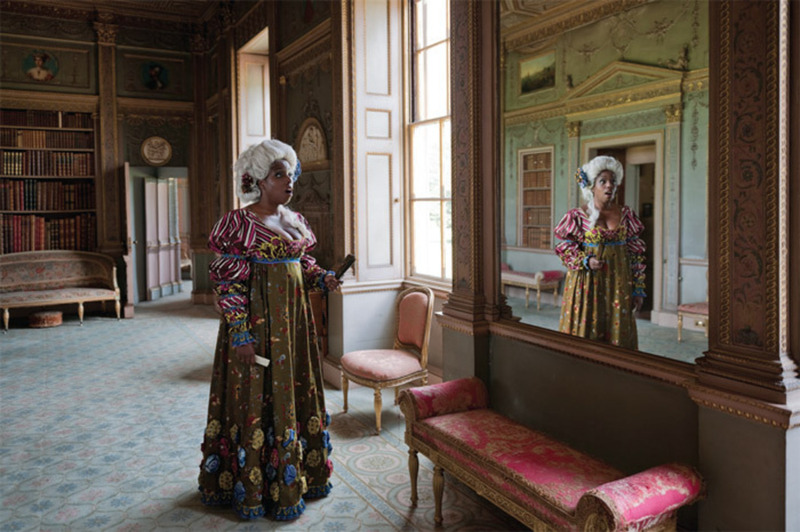 What stripes are to Daniel Buren or the “blp” is to Richard Artschwager, wax-printed cotton is to Yinka Shonibare, MBEa medium, a trademark, a transformative tool. These inexpensive fabrics were initially manufactured by the Dutch in the nineteenth century for trade in the Far East, but found a readier market in Africa, to the point that today they index that continent. To Shonibare they also index the trade between Europe and its former colonies, and accordingly a complex and problematic nest of arrangements among nations and races. Throughout Shonibare’s work in many media, these fabrics act as cheerfully decorative symbols and signatures, signs of worldly doings applicable, it seems, to almost any worldly object, changing its meaning.